The much anticipated Samsung Galaxy S4 will be available from 14 retailers across the US and the smartphone is already available for pre-ordering from AT&T. The AT&T version of the fourth generation Galaxy S smartphone is said to be launched on April 30 but the device might be available a week earlier. 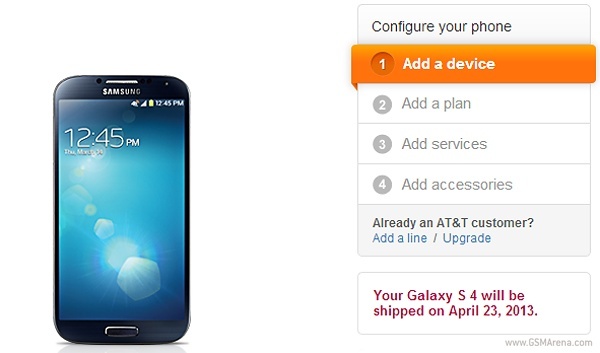 AT&T has updated its Samsung Galaxy S4 pre-order page and according to the new shipping date, the latest flagship smartphone from Samsung will be available from April 23. However, the pricing details of the device remain unaltered. Unfortunately, there is no official confirmation on the exact launch date of the smartphone as of now. Samsung galaxy Grand Latest verson of Anidoried phone.. best Fecture Of 8 Mp Fixcel Camera.. I dont care how cheap it looks like as long as I ve got all the festures I need and ability to change the battery. For me for a portable device is very important not the aspect as the flexibility in usage. well, I do need a radio fm they should live it on, the news are important to me if tv is not available. Samsung should not take of this feature at all. There was no reason for that.